Chicago native Daryl Davis graduated from Howard University with a degree in Jazz. As a pianist, vocalist and guitarist, he performs nationally and internationally with The Daryl Davis Band. He’s played all over the world with legends like Chuck Berry and Little Richard, but it’s what Daryl does in his free time that sets him apart. While music is his full-time profession, seeking to improve race relations nationwide has become a full-time obsession. After witnessing one of Davis' Rock'n'Roll/Boogie Woogie performances, a man told him he’d never seen a Black man play piano like Jerry Lee Lewis. The man at first had a hard time believing Davis' explanation of the Black origin of Lewis' style, but soon became a regular fan of Davis'. Turns out, he was a member of the Ku Klux Klan. This experience led to Davis becoming the first Black author to travel the country interviewing KKK leaders and members, asking questions like, “How can you hate me when you don’t even know me? Look at me and tell me to my face why you would lynch me. What can we all do together as a nation?” Today, Davis owns numerous Klan robes and hoods given to him by active members who became his friend and renounced the organization and their racist ideology. Building a collection piece by piece, story by story, person by person, he hoped to eventually open a “Museum of the Klan”. 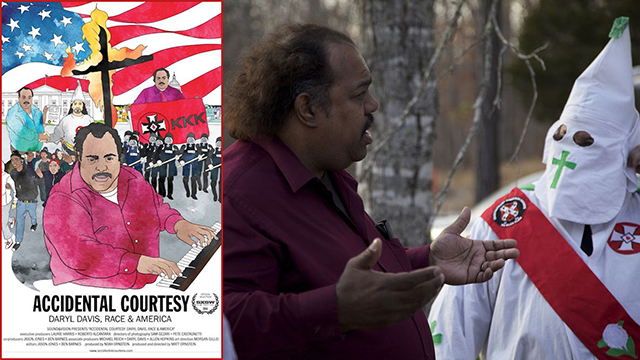 In "Accidental Courtesy," Davis' journey takes him across the country from DC to California, Arkansas, Tennessee, Missouri and Alabama, from old friends who have left the klan to friends still active in the organization, including a current Imperial Wizard of the KKK. In an age of digital disconnection, Davis' method is rooted in personal interaction. He has received the Elliott-Black and MLK awards as well as numerous other local and national awards for his work in race relations. He lectures nationwide and abroad on the topic.